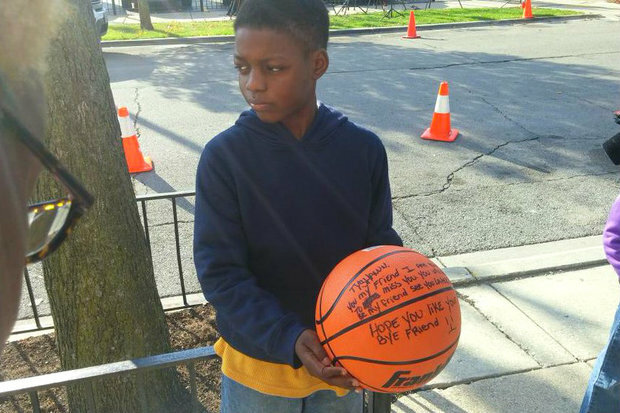 AUBURN GRESHAM — As 9-year-old Tyshawn Lee's casket was carried into St. Sabina Parish on the South Side Tuesday, a heartbroken friend of the slain boy stood outside the church holding a basketball. Demetrius Alexander, Tyshawn's classmate and basketball partner, said he would place the ball by the boy's casket. "You'll always be my friend ... see you later," he wrote on the ball. "Bye friend." News crews and a heavy police presence surrounded St. Sabina, 1210 W. 78th Place, Tuesday as a small red casket was carried into the church. As services for the 9-year-old began late Tuesday morning, the Rev. Michael Pfleger described Tyshawn as someone who "loved life." "He was smart, he was loving, he was caring. He was technically savvy. He loved basketball and video games," Pfleger said. "Tyshawn didn't just touch his family, his classmates, his friends. He touched a nation, and forced it to take a look at itself." "At point guard, Tamir Rice ... at power forward, Michael Brown ... at center, the girls of Birmingham." Before the service, community leaders addressed press gathered outside St. Sabina to express their feelings about Tyshawn's death. "He didn't deserve this fate," Ald. Derrick Curtis (18th) told reporters. "We've got to come together as a community to stop this." Minister Victoria Rollins, Tyshawn's great aunt, said the murder is a wakeup call that Chicagoans need to "guard our children well." "This is just multiplying, and it'll keep multiplying unless we do something different," Rollins said. "We've got to get out of the church and into the streets, and get the word out to make a change." After the ceremony, U.S. Rep. Bobby Rush said Tuesday's funeral was "not unique." "I'm disturbed by all the mothers who are grieving out there, and this funeral adds to my grief," Rush said. "This is happening all over the country, though I'd say Chicago is the epicenter. We need the nation's prayers, and their support." Tyshawn was targeted for execution, possibly because of his family's gang ties, Chicago Police Supt. Garry McCarthy said last week. He was killed near his grandmother's home in Auburn Gresham near the 8000 block of South Damen Avenue last Monday after being lured into an alley from a nearby park by his killers. On Monday, services were held for the boy at Haven of Rest Missionary Baptist Church, where even Chicagoans who did not know the boy showed up to pay their respects. The funeral itself sparked online outrage with Tyshawn's parents. First, his mother Karla Lee posted photos and videos to Instagram and Facebook, defending her purchase of a new car that was allegedly paid for with donations meant to go toward Tyshawn's funeral. Then, his father Pierre Stokes started selling T-shirts emblazoned with Tyshawn's face for up to $45. Pfleger said he was ignoring the controversy over the boy's parents, and said instead the city should focus on "an embarrassing and shameful new low" for Chicago — the execution of such a young child. "The only thing that's on my plate is putting Tyshawn to rest and finding his killer," Pfleger said. "We've raised $55,000 so far as a reward for anyone with information on the murder. We've gotten some very very very good leads, good information, but still waiting on that next jump. I'm hoping someone will be arrested before the funeral. I'm confident there's going to be an arrest." During the service, Pfleger set his sights on police and politicians who he suggested had failed Tyshawn and Chicago. Referencing the impact of a "code of silence" on policing, Pfleger said police "don't send that support to find out who's killing our children. Where is the federal law enforcement?" "How dare you, governor, cut our social programs so can balance the budget on the backs of the poor?" 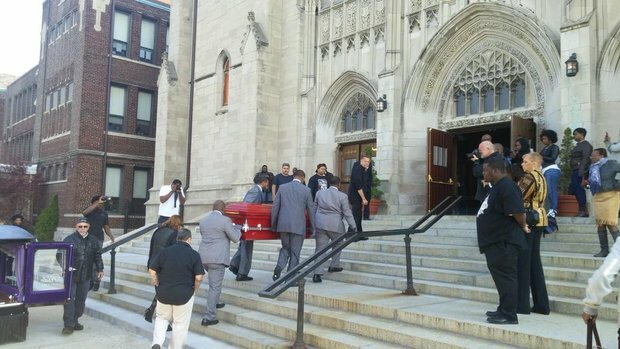 Tyshawn Lee's casket is carried into St. Sabina Church (DNAinfo/Alex Nitkin). 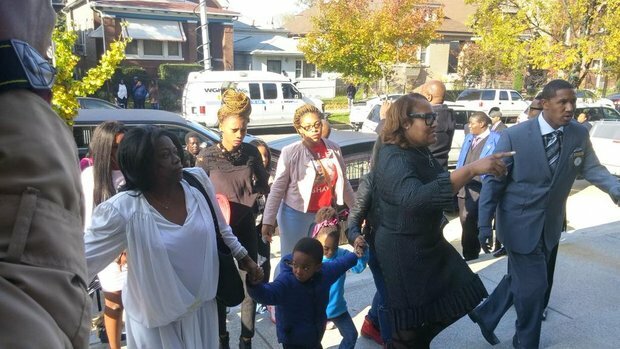 Tyshawn Lee's family enter St. Sabina Church for the 9-year-old's funeral. (DNAinfo/Alex Nitkin).